It's Valentine's Day soon and I would like to share with you how I made this valentine card. The inspiration for this card came from one of my vintage greeting card collections. I've always love the vintage, nostalgic look of another era and this particular card caught my eye. I just love the way these greeting cards look. I imagined the sender and the receiver of these cards, what their relationships were with each other, where do they live? What are their favorite food, what do they wear? What books do they like, etc. My imagination took me far and beyond that different characters start to appear in my mind until finally, other images appear until I chose one that I finally worked on. Step 1. I like the idea of the tree with a character hugging it. 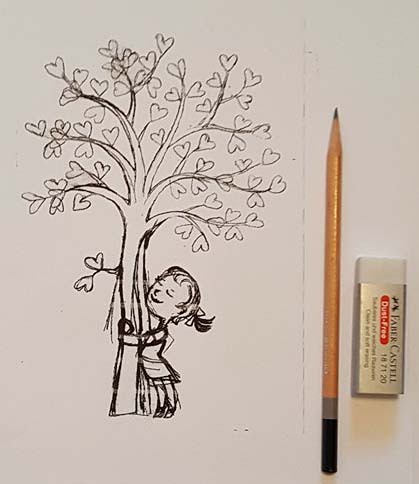 I chose a character of a girl so I made a rough sketch by hand of a girl hugging the tree. Step 2. I finalize the sketch, inked it with a Micron pen.and scan it in Photoshop, document size 5" x 7", which is the exact size of the card when printed. For My Etsy store, I used a professional POD printer. But my for Society6 shop, I just used my home printer to create proofs. Step 3. I colored the line art in Photoshop. I find it easier to change the color combination and correct mistakes when you work digitally. Step 4. I decided to create a collage of hand sewn skirt, ribbons and laces for the girl's outfit. On the right ,here are the hand-sewn little skirt and ribbons I made ( yes I did the sewing by hand) which I then scanned it again in Photoshop and added it in the card design. This part was really a lot of fun for me since it reminded me of playing with my paper dolls and sewing clothes for my dolls when I was a child. Step 5. Here's the final Version of my Valentine Card.